This morning brought a new skirmish in the silly “Is College Worth It?” discussion. The Gallup organization, in collaboration with my alma mater, released the second version of their “Index”. Headlines in the Chronicle of Higher Ed read “Just Half of Graduates Say Their College Education Was Worth the Cost“. Inside Higher Ed chimed in with Not Worth It?. So naturally, I downloaded the Gallup-Purdue report. The actual data raise a lot more questions than they answer. As the American Association of State Colleges and Universities pointed out, even the topline analysis was misdirected. 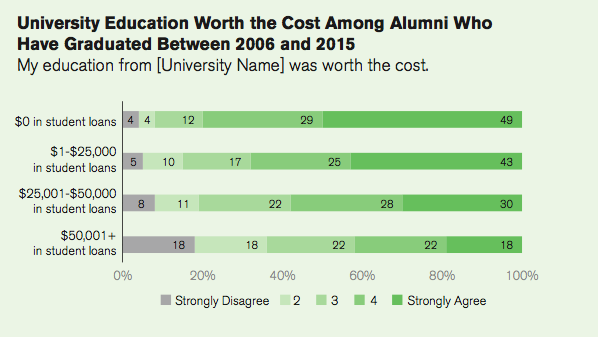 While it is true that “only” 50% of college graduates strongly agree that college was worth it, another 27% agreed, bringing the total agreeing to over 3 in 4. That’s to say nothing of the fact that there is no pre-existing data setting some expected benchmark to test against. Or the fact that asking attitudes about “college being worth it” is not the same as the actual financial benefit. The survey had about 30,000 respondents among those with a bachelor’s degree. Unfortunately, the main table above doesn’t provide the subgroup totals. With the exception of private for-profit institutions, the most telling statistic is that the type of institution doesn’t appear to matter much. The Gallup-Purdue report goes on to distinguish recent graduates from all graduates. That’s the lede on the Chronicle story. But the report doesn’t tell us the size of that subsample. Surprisingly, it doesn’t distinguish between institutional types where the degree came from. The report again only focuses on the percent who Strongly Agree. We have absolutely no idea what the overall agreement percentages are. And missing the subgroup numbers makes it hard to make sense of the data. The report explored an implicit hypothesis that favorable attitudes toward college would be negatively impacted by debt level. This is also surprising analysis for a couple of reasons. First, while they found that the median debt-level among recent grads was $30,000 (slightly higher than published figures), they analyzed four categories: no debt, $1-$25,000, $25,001-$50,000, and over $50,000. Again, there are no subgroup sizes nor breakdowns by institutional type. Another section of the survey examined the dependent variable by employment status and income level among recent graduates. While those who are underemployed are less satisfied (as we’d expect), it doesn’t look like that great of a difference; at least without subgroup population numbers. The other table breaks the same variable by income level. While recent graduates making over $120,000 (seriously?) are very satisfied, even those who make a mere $36,000 nearly match the national average. One positive aspect of the report were results on educational practices that positively impacted the “worth it” attitudes. Most significant is having a professor know the student, having a mentor, and having a professor get one excited about learning. Each of these nearly doubled the odds of a strongly favorable attitude. Unfortunately, these odds ratios aren’t clearly connected to the other data in ways that would improve college satisfaction. So what can we take away from the Gallup-Purdue Index? We’re left to guess, so here’s mine. If our focus is on enhancing student engagement, students see that college mattered. If we help them learn how to pursue their calling, the uncertainty of the job market isn’t quite as daunting. On the other hand, if we see students as a mean of funding our institutions, they’ll see our utilitarianism. If we think they are there to fill our classes and support our existence, we’ve offered little that adds intrinsic value. Finally, we should read reports like the Gallup-Purdue Index and see them as the starting place for our university conversations and strategic plans and not as shocking indictments of higher education at a time when it is so critically important for our society. Helpful analysis of the data. Your comment, ” If our focus is on enhancing student engagement, students see that college mattered”, is the key. This is also a focus that should or could be done in a smaller campus and class setting.